KUA’s “lax men … valiant athletes … ” in their second season, 1938-39. By 1893, long after Richards’ youth, regular football, baseball and track teams were competing with other schools. Class Field Days were also popular with many competitions such as putting shot, running high jump, pole vault, throwing hammer, half-mile run and throwing shot overhead. The next year, KUA held an intramural tennis tournament and it was announced in the school catalogue and reported in the school newspaper “that a first class instructor of physical culture is to be added to the faculty next year.” It was recognized, “that a man, to accomplish anything, must be thoroughly trained, not only mentally, but physically. They clearly perceive that the ideal men and women are found to have strong minds in strong bodies.” In March 1899, “field” competitions by class were held in the gymnasium which “resulted in three new records, and, considering the limited conditions, was a success.” Baxter Hall, built in 1892, had a designated room in the basement for a gymnasium. In it students practiced and held meets that included, among other events, running high jump, bar vault, fence vault, standing high jump, hitch kick and stretch kick. Somehow they were also able to practice basketball in this space, although the few games they played were held off campus. 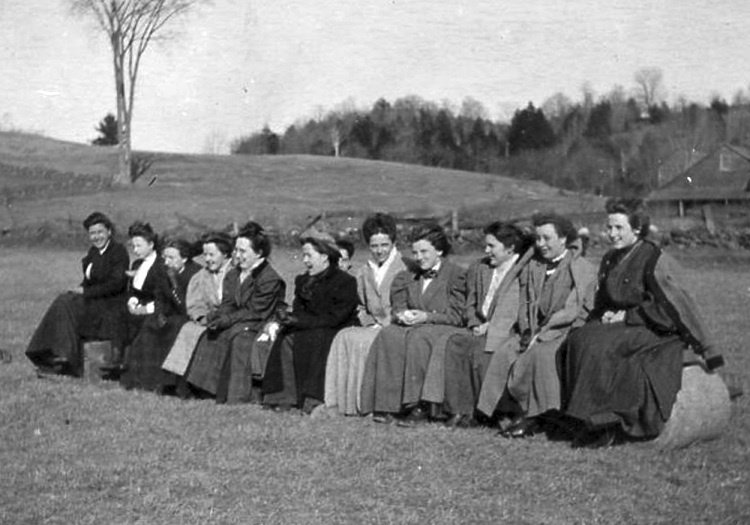 During the 19th and early 20th century, the KUA “ladies” could also enjoy coasting (sledding), skating, snowshoeing and chaperoned walks around the “mile square.” They were permitted to use the Baxter gymnasium during times convenient to the “gentlemen,” but cheering on their fellow male classmates was mainly their role in athletics and it was greatly appreciated by the boys! Imagine the excitement when the Silver Gymnasium, now the fitness center, opened in 1914 providing students with so much space for athletic opportunities: basketball games, for both boys and girls, could be played with fans cheering from the balcony; more room for calisthenics and gymnastics; space for theatre productions and Saturday night movies; a two-lane bowling alley in the basement along with locker rooms and showers; and, at one time, a fireplace for formal occasions such as winter carnival dances and various school receptions. In the 1930s, new sports, as they became popular throughout the country, were introduced to KUA. Competitive ski teams excelled; the Outing Club was occupied building log cabins and creating rope tows; competitive ice hockey, soccer, tennis and lacrosse, even golf, came along. These new activities often were the result of interest from a teacher or students looking for something new. That was the case for lacrosse and golf in the spring of 1938. 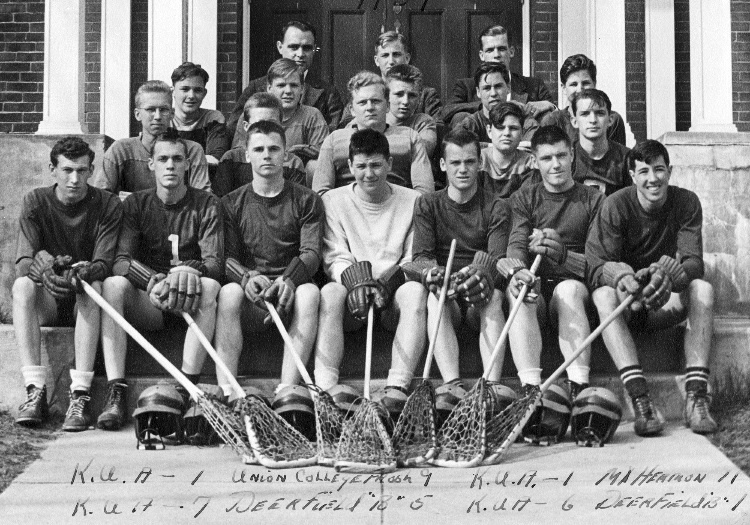 According to the yearbook, “lax men … valiant athletes, got together and organized a lacrosse team” — although no one knew much about lacrosse. Headmaster Brewster ’14 arranged for Coach Tom Dent, Dartmouth’s soccer and lacrosse coach (1926-1960), to come to campus and “introduce the boys to the fundamentals of the game in the gym.” Brewster, a baseball man, contributed personally to the new sport by purchasing “sticks” for the players. Doc Dawkins, Dartmouth ’38, “an all-New England guard, came from Hanover twice a week to coach them.” He set up KUA’s first game with a Dartmouth rec squad; KUA came away with a 5-4 win, but lost the rematch 6-5. They were pleased that there were only two minor injuries in their three games; they thought that “a remarkably fine record for a new and unskilled team.” Interest in the sport grew rapidly and it was reported that regular games would be scheduled the next year and they believed lacrosse would become a major sport at KUA. 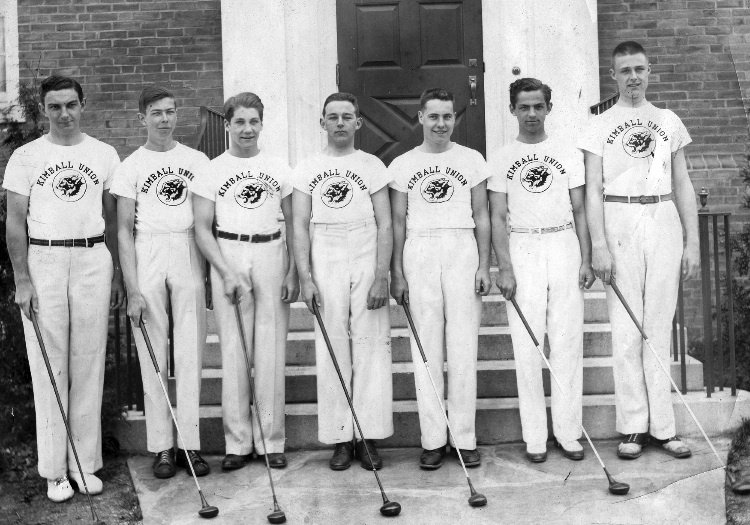 KUA’s first golf team, the “divot diggers,” 1937-38. KUA’s girls cheer on the boys’ teams, ca: 1900. When KUA returned to co-education in the fall of 1974, eleven girls enrolled and soon formed a field hockey team with Elva Mikula as their coach. From that moment on, KUA’s girls were not to be left behind on the sidelines. Many new sports, for their benefit, have been added over the years with the same spirit of innovation and perseverance as the boys’ teams of the 1930s. Historic KUA Hockey Footage – Behind the Gym from Kimball Union Academy on Vimeo. This archival footage from the 1940s, before the days of indoor rinks and artificial ice, shows one of our early hockey teams and what goes into playing outdoor hockey: putting up the boards, watering the ice when it’s cold, shoveling the snow off the ice and managing without locker rooms. The original rink was on Chellis Pond, but was moved to this area below the Silver Gym in the 1940s. The last outdoor rink was in the area of the Campus Center lawn and behind Chellis Hall. Kimball Union Academy is an independent boarding and day school for students in grades 9-12 and postgraduate in Meriden, New Hampshire near Dartmouth College. KUA was founded in 1813. Our mission is to prepare students for the challenges of tomorrow's world by inspiring academic mastery, creativity, responsibility, and leadership. This blog, begun as we prepared to celebrate our Bicentennial in 2013, celebrates our proud history.